In the autumn of 1949, in front of thousands of people in Tienanmen Square, Mao Tse-Tung, Chairman of the Communist Party of China stood on the podium over the Gate of Heavenly Peace (which gives its name to the square) and made a short speech which was to see the country follow a road for which millions had fought and died during the majority of the first half of the 20th century. 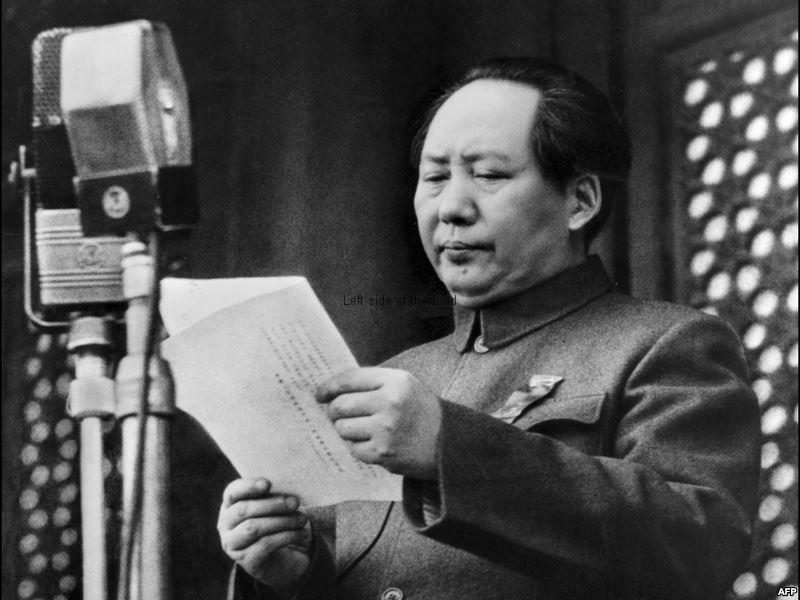 The date was 1st October, the speech, the Declaration of the People’s Republic of China. After a bloody war against the Japanese invaders and then an equally bloody civil conflict against the United States supported Nationalist forces of the Kuomintang, under the leadership of Chiang Kai-shek, the Chinese people had, as Mao declared a number of times during that period, ‘stood up’. No longer would the Chinese people be treated as slaves for the invading powers; no longer would imperialist powers (both minor and major) treat China as a country they could do with as they liked; no longer would the people kowtow to the Emperors who ensconced themselves in the palace at his back; no longer would the workers and peasants live in abject poverty whilst the wealth of their country was being enjoyed elsewhere; no longer would peasants be abused by avaricious and cruel landlords; no longer would the fate of poor Chinese women be that of concubines or prostitutes; no longer would it be necessary for Chinese families to migrate and face racism and humiliation in far off countries in efforts to achieve a better standard of living. Although there were still pockets of Nationalist opposition at the time of the declaration the new government set about challenging and changing what had become the lot of the majority of the Chinese people. As had happened immediately after the Russian Revolution, another country with a peasant majority, one of the first tasks was to take the land from the landlords and distribute it amongst the peasants who worked the land. Laws were passed to free women from the shackles of feudalism and patriarchy, where they were often treated as no more than chattel; education that had been denied to all but a privileged few was to be made universal; health care was to be made free for all and care of the elderly was to be an obligation of the State. This was the start of the era of the ‘iron rice bowl’, when State employees (which encompassed most workers in the cities as industry as well as ‘white collar’ jobs were all part of the nationalised structure) were guaranteed a job for life and access to the other welfare benefits. But the construction of socialism is not easy. Within a year of the declaration of the People’s Republic thousands of Chinese volunteers went off, yet again, to war, this time to prevent the United Nations troops from intervening in North Korea. Throughout the 1950s and 1960s different movements sought to learn from some of the mistakes made in the Soviet Union culminating in the Great Socialist Cultural Revolution that started in 1966. Although these mass political movements sought to prevent the restoration of capitalism in China a very short time after the death of Chairman Mao in September 1976 those who had been denounced during the Cultural Revolution had engineered a successful coup against the revolutionaries and started to dismantle all those advances in the construction of socialism that so many had fought for after Mao’s declaration on October 1st 1949. The 38 years since the death of the Chairman have not been good for China. In agriculture the communes and collective farms have been broken up and privatised – although not without resistance as news leaks out of countless battles between farmers and the security forces. Industries have been privatised and State enterprises broken up and organised in a way no different from what exists under capitalism. The once proud People’s Liberation Army, set up under the principal of ‘serving the people’ has transformed itself into an oppressor of the people and generals and other high officials have gorged themselves at the trough of the people’s wealth. Millionaires and billionaires abound and now the biggest market for luxury goods in the world is now the ‘People’s’ Republic of China, but a republic that is in the hands of the people in name only and led by renegades who besmirch the achievements of the once glorious Communist Party of China. The Chinese people, in the main, have accepted these changes. They now have ‘things’, consumer goods which were in short supply in the early years of the Republic. But these ‘things’ have been ‘gained’ at a price. The ‘iron rice bowl’ has been smashed to smithereens; education is being privatised, as is health; the once independent country that ‘stood up’ in 1949 is now allowing itself to be controlled and influenced by the very same countries that spent the first part of the 20th century trying to destroy and humiliate the Chinese people in general; and – in some ways even more disgraceful – China is turning into an imperialist power and exploiting and using its military strength to oppress people in other countries, especially a number of countries in Africa. Why the Chinese people have allowed this happen I don’t know. But then I don’t understand why this situation has been allowed to develop in a number of other countries where, at one time, the people had ‘stood up’, proud, independent and with a perspective on the future that wasn’t based on exploitation and oppression. So if 65 years ago there was a sense of optimism at the time of Chairman Mao’s declaration what are the main subjects presented in the current edition of Beijing Review, the long-established foreign language publication of the People’s Republic? A boasting of the level of Outbound Direct Investment; a celebration of the floatation of the e-commerce company Alibaba on the New York Stock Exchange in September, the largest amount of trading in one company in one day ever; a call for more private (read foreign) capital investment in China’s oil, natural gas, banking and railway enterprises; boasts about the unsustainable rates of growth in China outstripping those of the United States by factors of 5 or 6; and boasts of how the Gross Domestic Product (GDP) of China will soon overtake that of the US and become the biggest in the world. But this all comes at a price. And that price is always paid by the poorest in society. They can either accept it or pick up the baton that was carried by the Maoist Communist Party of China for many years but which has been dropped and trampled in the dust. The people of China are yet again on their knees. How long will it be before a future leader stands over the Gate of Heavenly Peace and pronounce such inspiring words as the Chairman did on Saturday 1st October 1949? This entry was posted in Asia, China, October, Revolutionary Year and tagged china, communist party of china, mao, marxism-leninism, people's republic, tse tung, zedong by Michael. Bookmark the permalink. Excellent analysis. You got this right. Today, China is an economic free-for-all or economic Wild West. While regulations exist, they are not enforced, or only selectively so. Nothing wrong with moving ahead with a progressive economy, but China had an opportunity to do so while preventing some of the downsides to it and failed (i.e. environmental problems, lack of business ethics, excessive gaps in wealth, lack of healthcare). I don’t think Mao envisioned beggars on urban streets and blatant prostitution in the 21st century. While the CPC is making renewed attempts to combat business and Party corruption, it seems to be selectively targeted and only token public relations efforts. China seems to be a ship without a captain.